Legend tells of the demonic sorcerer Wu-Feng, a necromancer whose armies of darkness once spilled rivers of blood across the Middle Kingdom. Many fought against his tyranny. Many died in the attempt. Legend says that he was defeated, and that his ashes were buried in the cemetery of a small village. Legends fade into myth, and myth, though oft forgotten and meandering in the details, has a nasty habit of coming back to trouble the living. As the restless spirit of the evil sorcerer zeroes in on the location of his burial, it’s up to a small group of Taoist monks to hold back the nightmarish ghosts and fiends that serve the Lord of the Nine Hells. All the while, they await the appearance of Wu-Feng’s newest incarnation, as the necromancer musters enough dark magic to take physical form and come for his remains himself. So embodied, Wu-Feng will be powerful in the physical realm, but also vulnerable to being slain yet again and dispatched back to Hell. In Ghost Stories, that’s your job. 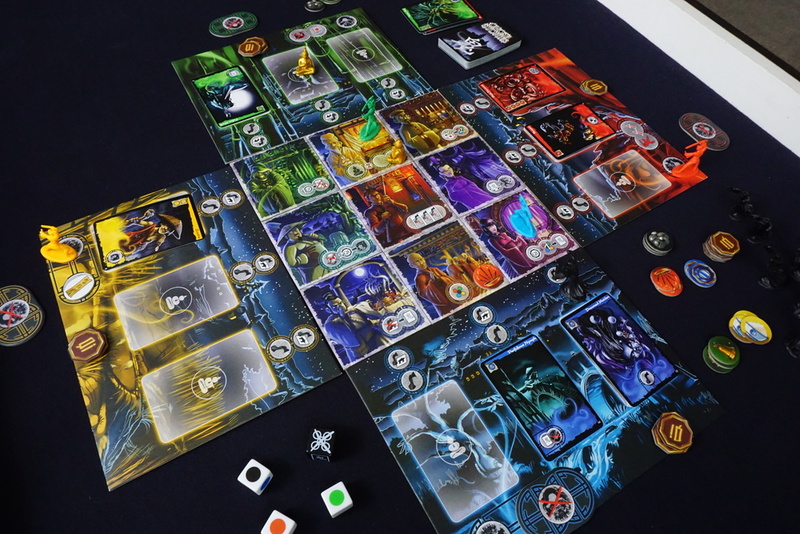 Ghost Stories is a four-player cooperative game that evokes traditional Chinese horror visuals to depict the battle between the living and the dead. On each player’s turn, a new monstrosity from Wu-Feng’s army arrives to threaten the small village, following which the active player may take one move and one action – either fighting fiends directly, or working with the villagers to collect resources or establish stronger defenses against the endless hordes. The monsters just keep coming, and any sense of real progress can be hastily undone by the arrival of fiends who invite company along for the ride. Most of the game is dedicated to survival; a deck of ghost cards will continuously throw new threats at the players, arriving to fill one of twelve spots on the player boards. If a player’s board is full at the start of their turn, they will take damage instead – and the monsters will politely wait until there is room before they continue advancing. Don’t mistake that for a breather, however – the goal of the game lies ten cards from the bottom of the deck, where the incarnation of Wu-Feng lurks. Your objective is to survive until the sorcerer appears, and then defeat him in whatever form he has taken. Monsters come in five colors, four of which correspond to the colors of the players. From the Red mountains, violent fiends and those possessed by sinful spirits descend, looking to spill blood. The Yellow rice paddies are the haunt of the restless dead, breaking free of their coffins to stalk into the village. Serpentine sirens and nightmares from the depths crawl forth from the Blue river, seeking to drown the unwary. Unclean spirits lurk in the Green bamboo forest, some possessing the plant matter to form rotting bodies that crawl from the muck. Worst of all are Wu-Feng’s most elite agents, represented by the neutral color Black and offering the most direct and immediate threats to the Taoists. Again, the inspiration is Eastern mythologies, specifically traditional Chinese legends. One will not find goblins, dragons, and bedsheet phantoms springing out from behind a tree – here the Skinner approaches to rend flesh from bone, Sharp-Nailed Mistresses lurk half-submerged in still waters, Severed Heads form a shrieking cacophony of hate, and the Fury of Depth rises up to torment the living with the curses of the watery abyss. Figures of ooze and fungus, shadowy wraiths with smoking eyeholes, tentacled abominations hungry for blood, and twisted writhing walls of flesh and slavering mouths make up the kind of entities that will appear to march on the village. The artwork is dark but distinctive, the monsters emerging from shadowy backgrounds in bright colors that show off their glory and oft-grisly nature. As for the game itself, Ghost Stories is relentlessly challenging, a stabilized game state eternally ready to turn on a dime. 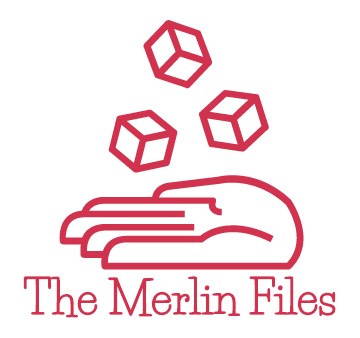 Players fight ghosts by rolling dice, hoping to match their colors at whatever strength their opponent represents (1-4 matches required for normal foes). Collecting special Tao items can weaken the monsters further, but each successful fight consumes whatever items are used in such a manner, and a new ghost is waiting just around the corner. Village spaces provide various benefits, from collecting Tao items to resurrecting a fallen friend to having the local sorcerer destroy a ghost entirely, but some village services have an associated cost. Each player also has a special Yin-Yang token, which can be cashed in for an extra action, and a special power based on player color, each one offering two choices. The Red monk specializes in moving around the village, the Blue monk can take additional actions, the Green monk is a powerful combatant who resists curses, and the Yellow monk channels the power of sacred Tao items. The game is won by confronting and defeating the incarnation of Wu-Feng; it is lost when all four monks are dead, or when any three Village tiles have become haunted, or when the deck of ghosts runs out of cards. Many types of ghost impose special penalties when they manifest, such as denying one of the three combat dice as long as they remain on the board, calling an additional ghost to join the battle, or sealing the special ability of the Taoist they are confronting. Furthermore, some ghosts are Tormentors, who force their Taoist to roll the Curse die at the start of the turn, or Haunters, who gradually advance toward the village and will haunt the next tile in their path once they arrive. The approach of a player’s turn is marked not only by planning actions, but also by desperate attempts to deal with a particularly threatening entity before it has a chance to strike. Ghost Stories is easily among the most challenging cooperative games our group has ever played; our track record with its easiest difficulty level is perhaps three games won, one of which was last night. The final boss, Wu-Feng, can appear in any one of ten forms, his incarnation unknown until he arrives. He may arrive as a Vampire Lord, a Haunter in his own right; as the Dark Mistress, who seals sacred Tao items and prevents their use in combat; or perhaps he is Uncatchable, requiring the use of a sacred Buddha statue to pin down before he can be battled. These and seven more forms provide diverse endgames, and at higher difficulties Wu-Feng will incarnate multiple times throughout the game. Similar replayability arises from the modular village; its nine tiles, arranged randomly, help determine the most viable strategies. It may be useful to funnel ghosts toward a corner where the Blue monk can gather Tao items and then challenge the fiends on the same turn, or keep the Green monk close to the graveyard in case an ally needs to be resurrected, trusting in his powers to avoid the curse that awaits those who give life to the dead. The Red monk has an unfortunate habit of feeling lackluster, having no options to enhance combat ability and often seeming like a support character; nonetheless, we have seen the Red monk’s skills be invaluable in making it possible to win the game. Ghost Stories is definitely not recommended for one’s first experience with cooperative games; it occupies a rare category in which things get out of hand so relentlessly fast that actual cooperation often gives way to players individually realizing “this is what I must do to put out the largest fire right now.” That the game offers dice for combat can feel almost counterintuitive, given how easily one can fail to destroy even the weakest monsters using dice alone. It takes a few plays to understand how best to use the village tiles and that rewards are often bait to play badly by risking direct fights against the most dangerous ghosts. All this is not to say that it’s a bad game; however, I know many people, even experienced players, who start the game frustrated by a feeling that the group is sure to lose. Arguably, that’s sort of the point – Ghost Stories is pitched as a difficult cooperative game, and the feeling that everything is going straight to hell is spelled out in the game’s introductory paragraph as, well, quite literally the plot. For resource marshaling and management, the need to respond to emerging threats, and the sheer replayability inherent in the game’s setup, Ghost Stories offers a lot of entertainment in a relatively small box. It’s a relatively fast and frantic defense game that should invariably result in a great battle, no matter whether you win or lose. For those more versed in cooperative games already, it’s a great addition to the genre. Nice write-up. I’ve always enjoyed the game, though there was a stretch where it started to feel too hard and/or hopeless. As we’ve improved it is still really hard, but not usually desperately so. 1) Minimizing the number of wasted turns. If you spend a lot of rounds attacking while hoping for a lucky roll you’re setting yourself up for trouble. 2) As mentioned in your write-up, using statues or the townsfolk to take care of the harder ghosts and not worrying about the ‘lost’ rewards was a key shift for us. A key way to avoid wasted turns. Fun game, I like that you have to deal with rapid changes to the board situation so you can’t really plan too far ahead, keeps things moving.